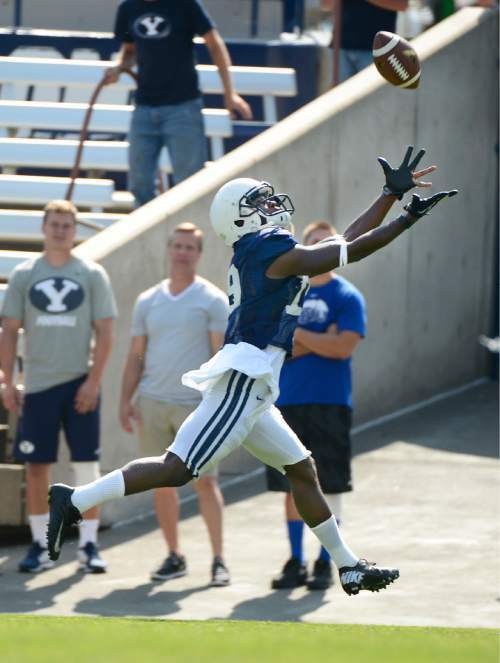 Devon Blackmon re-adjusting to life at BYU after his best friend, Jamaal Williams, withdrew from the school. Provo • In what amounted to a cultural exchange, of sorts, between a pair of good friends and senior receivers, Devon Blackmon invited Kurt Henderson to visit his hometown of Fontana, Calif., this past summer so the native Utahn from a two-parent St. George family with seven children could see for himself why Blackmon was finding it so hard to assimilate at BYU. "I took Kurt back to California, and he was shocked, simply shocked, because he didn&apos;t know it was that real," said Blackmon. "I was like, &apos;this is what I grew up with. This is how I lived, right here on these streets. This is what it is like here. This is how we do it here.&apos; "
Blackmon, one of approximately 20 African-Americans on the Cougar football team, says he took his teammate to neighborhoods where Henderson was the only white person around, so the honors student who served his mission in Helsinki, Finland, could feel what it was like to be stared at for no apparent reason, much as Blackmon says he is in Utah. Blackmon showed Henderson where drug deals were going down, where he could hear police sirens almost every hour of the day. 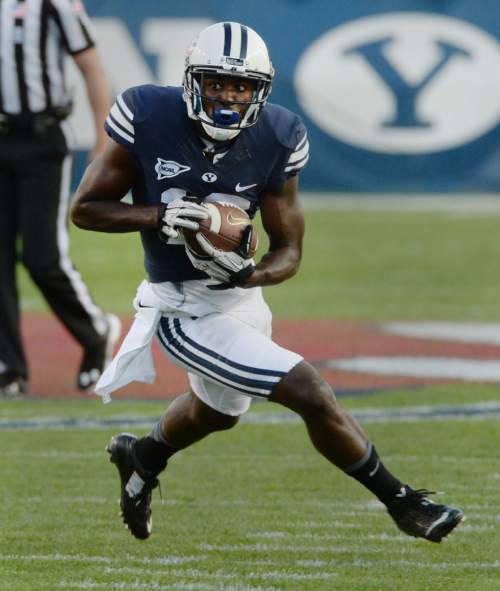 "I love my teammates at BYU, but most of them just can&apos;t relate to me," said Blackmon. "The things that I grew up seeing, they&apos;ve never seen before. Most of them grew up protected and sheltered. Most of them have two-parent homes. I was exposed to the world at the age of seven, eight, nine. I am seeing people smoke weed, I am seeing people do [drugs]. I am seeing fights. I am seeing guns. I am seeing alcohol abuse every day. I am witnessing all that. You know what I mean?" 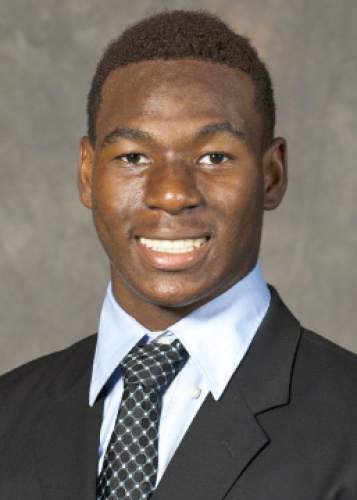 Jamaal Williams knows what Blackmon means. Trouble is, the star running back who persuaded his former high school teammate to join him at BYU is no longer around, having been urged to withdraw from the school owned and operated by The Church of Jesus Christ of Latter-day Saints a few days before preseason training camp began on Aug. 8. The Salt Lake Tribune has learned that Williams withdrew for a variety of reasons, some related to his health after knee surgery last fall, and some related to honor code missteps. Lifelong friends • Blackmon and Williams were seemingly joined at the hip in Williams&apos; third year in Provo and Blackmon&apos;s first. Now that his best friend is gone, Blackmon, who is a year older, is struggling mightily to fit in, he acknowledged on Wednesday. "It was a two-man wolfpack, me and Jamaal," Blackmon said. "And when I lost the other wolf, it was like, &apos;gosh dang.&apos; I didn&apos;t hang with anybody else because no one else gets me like Jamaal. It has been hard, man. It has been a difficult month. Now I have to go through everything by myself, being a black man up in Provo, just being in this environment by myself." Blackmon said his teammates  both white and those of color  have reached out to fill the void, but many are 24 or 25, having served two-year church missions, and many are married or come from different backgrounds so they have trouble understanding what makes him tick. "I mean, everybody has their cliques," said Blackmon, who signed with Oregon out of Summit High in Fontana but withdrew midway through his freshman season and transferred to Riverside (Calif.) City College. "And that&apos;s natural. You can go to Oregon and they have their own cliques. You can go to Alabama and they have their own cliques. I wasn&apos;t in a clique. It was me and Jamaal, and we are obviously on another level when we hang out." When he leaves the football complex, he visits a white family in the area who treats him like one of their own, or goes to a music studio in Springville where "I am really into making music, filling my time with music and trying to be a better person," he said. 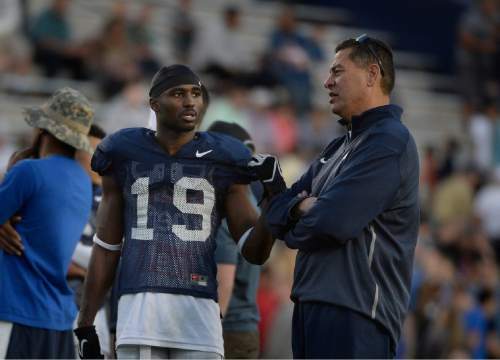 Coaches understand • BYU coach Bronco Mendenhall said he realizes the bond that exists between Blackmon and Williams, and that Blackmon needs support. 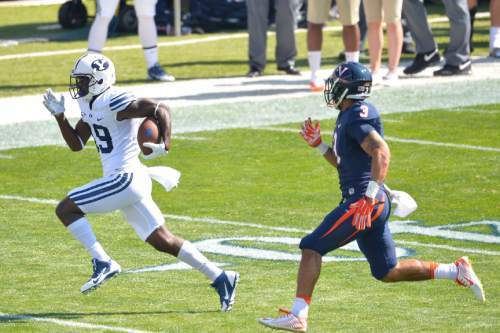 "Those two are really close, and one of the main reasons Devon came to BYU was Jamaal, and Jamaal&apos;s family&apos;s influence on how neat of a place BYU is," Mendenhall said. "And they still feel that way. Jamaal&apos;s mom [Nicole Williams, who was Blackmon&apos;s high school track coach] especially still feels that way, and so yeah, it is hard for Devon. But he is handling it really well and I think he&apos;s making the most of his opportunity." Receivers coach Guy Holliday can relate to the enigmatic Blackmon as the only African-American on the staff, and says the wideout who caught 10 passes for 130 yards last season has matured enough in the past year that he can handle Williams&apos; absence. "Everything happens for a reason. I think it is going to work out," Holliday said. "I talk to all my players [about their off-field struggles]. Devon has grown up a lot. He was really close to [Williams], but I think this has helped him open up and realize that he can fit everywhere and be around different people. That has helped him tremendously." Growing up fast • Ashanti Devon Blackmon was raised alone by his single mother, Ayanna, until he was eight. Then a step-father, Lawal Balogon, came along and provided some stability and discipline. Life got better, but the blended family struggled financially even as Devon was blossoming into a track champion in the 110-meter hurdles and football star due to his blazing speed. His biological father re-entered his life when he was 16, but money was still tight. "I wrote a poem about that last night," Blackmon said. "I would go to a store, and I couldn&apos;t get what I wanted. It wasn&apos;t because my mom didn&apos;t want to get it for me. It was because she couldn&apos;t afford it. And then, when I went to the cash register, and they had to put it back, it was kind of embarrassing. That kind of stuff just really humbled me." Blackmon is on track to graduate next April with a degree in family and consumer science. He wants to be a football coach so he can teach youngsters the game and the "politics that come with it," as well as the importance of hard work. "My road and journey is different than [that of] most of my teammates," he said. "God placed me in this position because I have to learn things differently and go through this journey. There is nothing wrong with my situation or my upbringing. My mom did a good job. My stepdad did a helluva job. I was getting whupped almost every day." No regrets, just big expectations • Blackmon had plenty of other options after shining at Riverside City College, but his overriding desire to be reunited with Williams  who had some ups and downs off the field, but sparkled on it- brought him to BYU. But his junior season was a disappointment, his playing time limited due to the presence of outstanding receivers Jordan Leslie and Mitch Mathews and his own inability to learn the playbook. And he started off on the wrong foot. Blackmon was suspended for the season-opener against UConn for wearing earrings  a BYU no-no forbidden by the honor code  in the football facility. Blackmon claims that an assistant coach ratted him out to Mendenhall, who was also upset that the player announced his suspension on social media. "So that really threw me off, right from the start," Blackmon said. "It was just an earring. But I signed the honor code. I gotta man up and admit that was my mistake. 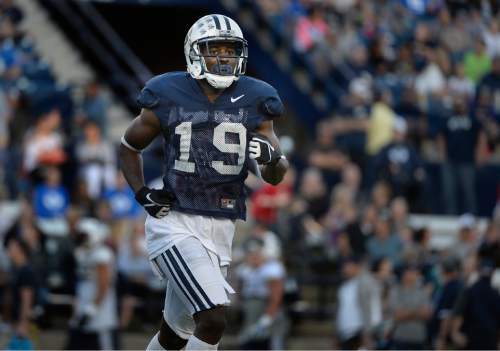 It was nobody else&apos;s."
Now that he won&apos;t get to play his senior year with Williams  who has said he will return in 2016  Blackmon is often asked if he regrets signing with BYU. "The decision has already been made, and there&apos;s no regrets," he said. "But I will say this: I just wish that when I came here, I would have known about the challenges." "Stuff like the honor code and the environment, dealing with everything, the politics and all that. But I don&apos;t regret it. I needed to come here. I love it here. Like, I love [BYU] President [Kevin] Worthen," he said. "The Worthens always come say hi to me. I love the people here. I love the Mormon culture here. I like how they want to learn about my culture. But when I see things I don&apos;t like, when I feel some of the tension [from being a non-Mormon, and a racial minority], it kind of backs me up  if that makes sense. … Other than that, I don&apos;t regret it. I have learned a lot coming here. I can&apos;t even say it enough, bro. I love the people here, all this." As for the upcoming season, Blackmon says he just wants to be a contributor and play for himself and his departed friend, Williams. "I thank God for bringing me this far, and giving me the strength to be here, and enduring this long five-year journey that I have been on," he said. • Signed with Oregon in 2012 after a standout prep career playing multiple positions at Summit High in Fontana, Calif.
• Transferred from Oregon to Riverside (Calif.) City College and helped the Tigers go 10-2 in 2013, catching 29 passes for 526 yards and six touchdowns. 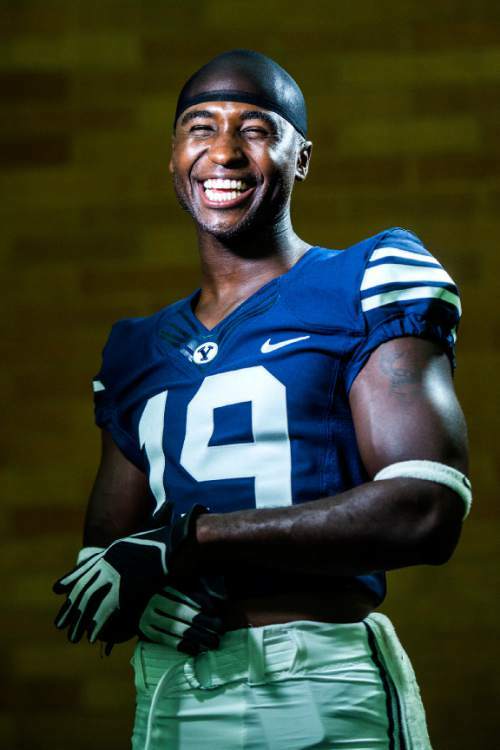 • Signed with BYU in 2014 at the urging of childhood friend Jamaal Williams and caught 10 passes for 130 yards.